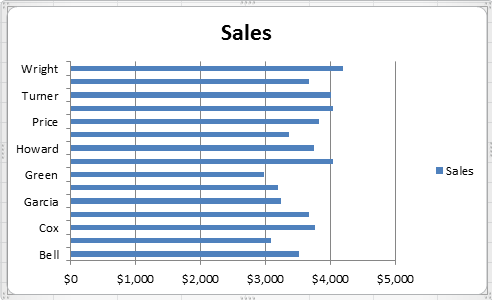 Excel’s built-in chart types are great for quickly visualizing your data. The horizontal bar chart is a great example of an easy to use graph type. Sometimes, though, it can be useful to call attention to a particular value or performance level, like an average or a min/max threshhold. In that case, you’ll want to add a vertical line across the horizontal bars at a specific value. 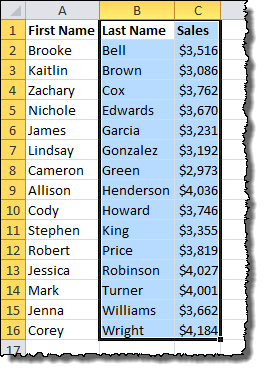 This quick tutorial will walk through a quick way to add a vertical line to the horizontal bar chart type in Excel. As an example, we’ll use annual sales performance with an average value line. Let’s build a horizontal bar chart for the data. 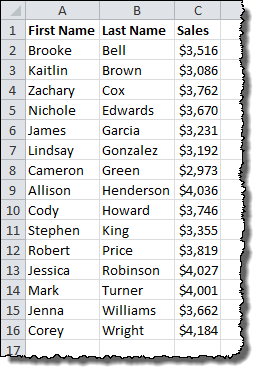 Select the Last Name and Sales columns. 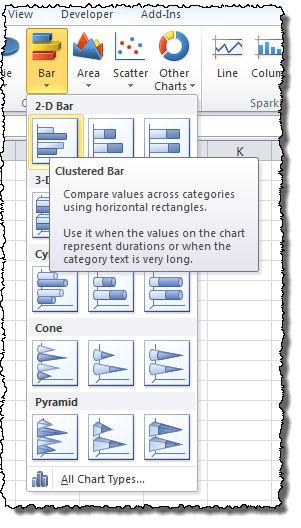 On the Insert menu tab under Charts, choose the Bar icon and select the Clustered Bar chart type. Excellent! This solved the issue I’ve been working on the entire morning! Agreed – this is excellent! Thank you – solved the problem I thought I was completely stuck with. At last. Got the line on my chart. Took a few goes but got there eventually. Thanks for the explanation. I recorded the steps mentioned above in a macro and used the same in the VBA code. Great guide, thanks so much. I had almost given up on being able to make the report in Excel the way I’d been asked to! Just superb, thank you. And thank goodness somebody like you exists to help us all. Awesome !!! Thanks a ton. This helped me a lot..
After creating a chart, where is it shown how to add a vertical threshold line? The article is broken up into steps to make it easier to follow (it’s very long otherwise!). Please click on the link to page 2 at the bottom or go to step 2 in the Quick Navigation box at the top to get to the next step in the process! No, it’s not just you. At the top of the page in the “Quick Navigation Box” there are links to several pages. The first, “1. 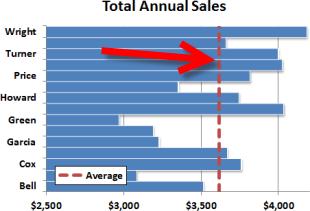 Building a Basic Horizontal Bar Chart” shows how to create a chart. In order to add a horizontal line, you need to go through all of the links, from 1 to 5. Thank you. This is very clearly laid out. Very helpful guide – excellent ! Genius, thank you so much! is there a way to add a coloured vertical box instead of a vertical line?